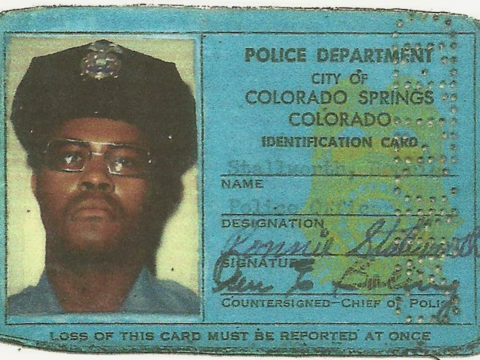 I've been interested in the movie BlackkKlansman, watching several of its trailers many times but never managing to get out to see it in the theater - but now it's available online so I watched it. Some of the reviews of the movie were mixed but I thought it was great. It think Spike Lee achieved a perfect synthesis of fact and fiction, art and reality. I will watch it again. Politifact provides a review of where the movie diverged from the historical record as recounted in Ron Stallworth's book and contemporary news reports. Fun fact, I know one of the background actors playing a Klansman - the guy is the furthest thing from a Klansman so it was really amusing. I admit I haven't seen much of Spike Lee's work but I think this one will end up being considered his masterpiece. Not only did I enjoy the well-plotted, exciting movie (although there were some harrowing moments as when the character portrayed by Harry Belafonte recounts a lynching) I appreciated the mention of the "race science" by David Duke (Topher Grace) of Nobel Prize winner William Shockley and the wording was so similar to the defense of current race-science proponents for their scientific racism, I was amazed. I will definitely discuss that in my planned upcoming podcast Steven Pinker, the Intellectual Dark Web, and Race Science. 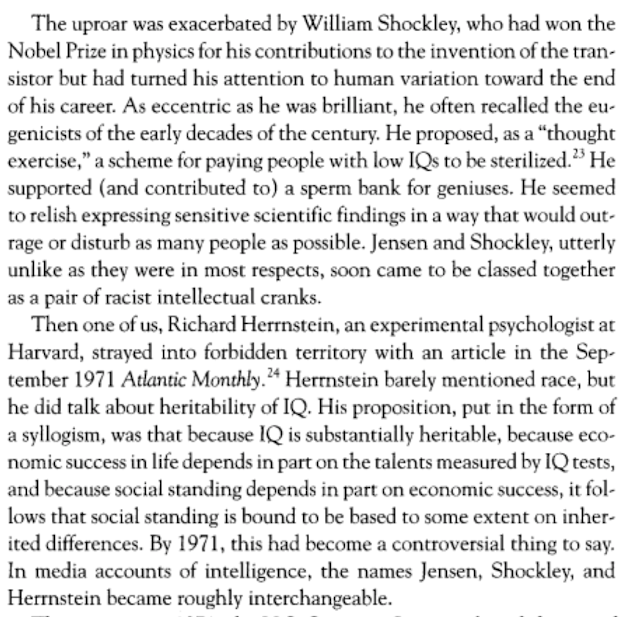 And of course, inevitably, the Pioneer Fund supported Shockley's eugenics. 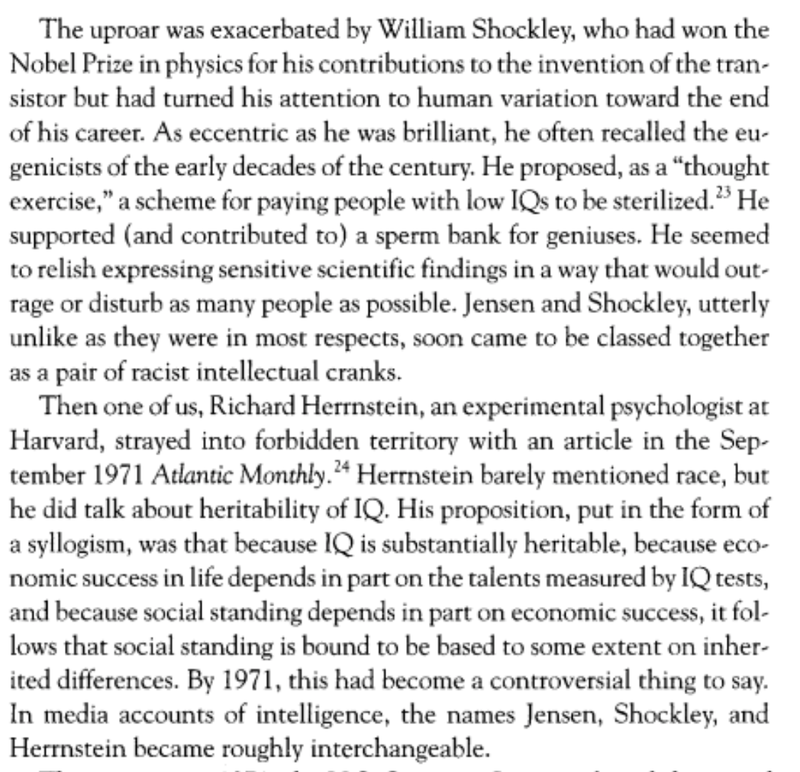 In "The Bell Curve" Murray and Herrstein mention the connection between Herrnstein and Shockley in the public's mind but seem to feel that although they agree substantially about eugenics, Shockley's style was "eccentric" and therefore an unfair comparison.